Hurricane Harvey “has thrown the energy market into disarray,” said Jessica Summers in Bloomberg.com. Gasoline prices surged to a two-year high this week as the storm pounded oil refineries along the U.S. Gulf Coast. Gas futures for September climbed to $1.90 a gallon on the New York Mercantile Exchange, meaning prices for consumers are likely to rise in the weeks to come. 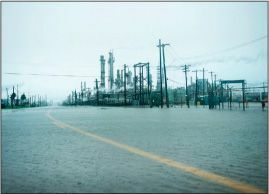 So far, the storm has knocked out nearly a quarter of the nation’s refining capacity, with nearly every major Texas and Louisiana refinery partly or completely shut down because of damage or for safety reasons. That includes Motiva Enterprises’ refinery in Port Arthur, Texas—the biggest in the country. The aftermath of the storm could bring questions about the Gulf Coast’s future as an energy hub, said Clifford Krauss and Hiroko Tabuchi in The New York Times. The Texas and Louisiana coasts, which contain much of the nation’s chemical production, are exceedingly vulnerable to storms that “experts say are becoming more extreme because of climate change.” Energy companies will have to weigh the cost of upgrading their infrastructure versus the cost of relocating. “The hurricane did what terrorists could only dream of” in terms of exposing our energy vulnerability, said Michael Webber of the University of Texas at Austin’s Energy Institute. “A relic of South Korea’s economy-first ethos could be changing,” said Matt Stiles in the Los Angeles Times. Analysts say that Samsung heir Lee Jae-yong, who was sentenced to five years in prison last week for paying bribes to disgraced former President Park Geun-hye, isn’t likely to receive a pardon if his appeal fails. South Korean presidents have historically pardoned high-ranking executives at South Korea’s massive family-owned conglomerates, known as chaebol. But after a sprawling corruption scandal brought down President Park this year, public sentiment has turned against clemency. Apple is getting a hefty tax break to do business in Iowa, said David Pitt in the Associated Press. The state approved a deal last week to grant the technology giant $280 million in state and local tax incentives to build two data storage centers near Des Moines. The $1.4 billion project will create at least 50 jobs, with Apple also investing $100 million in a newly created public-works fund. However, “critics questioned the wisdom and fairness of giving such tax breaks to one of the world’s richest companies,” especially when the state is already facing a budget shortfall. Japan’s SoftBank is making a massive investment in co-working, said Ellen Huet in Bloomberg.com. The New York–based WeWork, which rents office space to freelance workers and startups, last week accepted a $4.4 billion investment from SoftBank that will go toward an “aggressive global expansion plan” in Asia. SoftBank has been investing heavily in startups through its $100 billion Vision Fund, “rankling venture capitalists” who believe it’s creating a frothy market by driving up valuations. The deal will increase WeWork’s valuation to $20 billion, making it one of the world’s five most valuable venture-backed startups.